Anthony, Lucy, and George of Lockwood & Co. have been continuing to thrive in the ghost hunting and eradicating business--with only a few flops here and there. Or more. Really, it's because Quill Kippes and his team of Fittes agents keep interfering. Lockwood finally calls to settle the matter with a little wager: they go on the same case and whomever loses has to admit defeat in the newspaper. The investigation however? 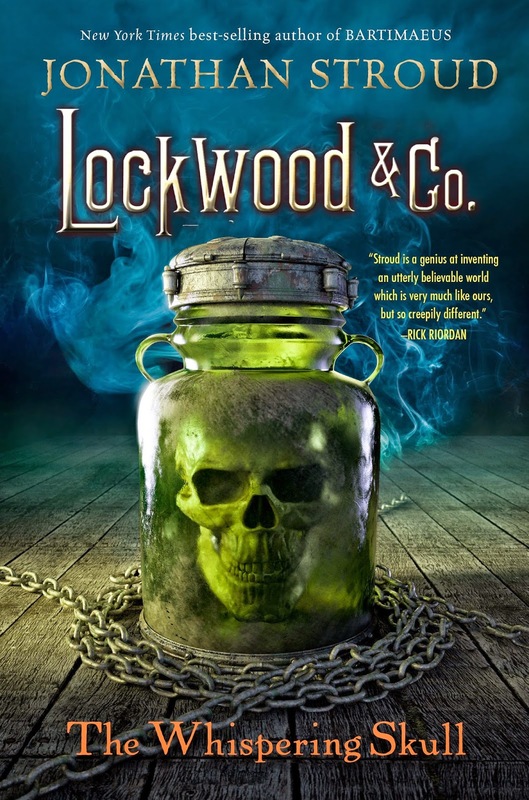 It involves the most dangerously haunted artifact Lockwood & Co. has ever encountered. And it seems as though a certain skull in their possession has something to say about it. It's good. Of course it's good. It's amazing. Once again, I love Stroud's ability to create a situation that feels terrifyingly realistic. The characters are complex, lovable, and well written. The last page had me gasping aloud and wanting the next book already. But I may have been a little too excited and built it up too much in my mind. It was a little slow to get started, unlike the first one in the series. The first one also felt a bit more scary, more dangerous and thus, more exciting. This one definitely goes into the character's stories--their strengths and weaknesses--more than terrifying ghost battles. Which is great, don't get me wrong, just not what I expected. So now I know. And you do, too. So you should go read it. Check out my rave review for Book 1.